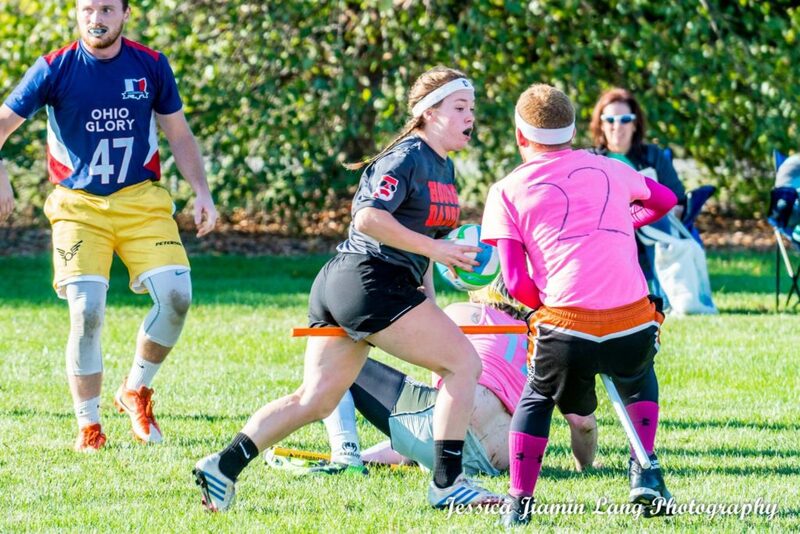 Now that we’ve provided you with a game-day guide, check out some of Managerial Editor Tyler Walker’s quick takes on storylines to follow at the Great Lakes Regional Championship. All of the Great Lakes’ seekers left the college scene this year, and not just at the top. Of the 10 teams competing this weekend, seven lost their primary seeker from last season. Mitch Boehm, Zach Fogel and Jack Slater have all left Ohio State, University of Michigan and Central Michigan University, respectively. Jason Bowling left Ball State University for Lake Erie Elite and Sam Roitblat, Max Mcadoo and Chandler Adams all traded their Bowling Green State University jerseys for Ohio Glory. All of the college teams have potential at seeker, but no one has broken out. Ball State has Nick Kaufman, who has the build and has a lot of experience from MLQ, along with Nathan Ellert who backed up Bowling last season. Central Michigan’s Matt Long has shown promise this season, but Central Michigan’s SWIM record is nothing to write home about. Michigan State’s seeker rotation is the most intact from last season, with both Tawfik Abbas and Kyle Judkins returning. Both players are solid, but neither are guaranteed to close the game out. Overall, most teams will just throw a lot of different looks at the snitch, using fast subs of new players. If a team comes out this weekend with a shored-up seeker game or a new seeker with a hot hand, it could easily mean a regional title. The round-robin system benefits deeper teams. There are a lot of games to play this weekend and with regional parity at an all-time high, every team will have to dip into their bench. Grand Valley State University should be a team that has no problem with the new format, since they traditionally use their entire roster. That should pay off big this weekend. Parity reigns in the region, where nearly every team can and has kept one another in range. With such competitive games to play all weekend, this tournament will favor teams that can get quality play from their back rotations. It is generally expected that the community team championship will be decided on Sunday at either 9 a.m. or 3:45 p.m when Lake Erie and Ohio Glory play their second and third games against each other. But the outsider of the community teams is Hoosier Daddies. As mentioned before, the Hoosier Daddies have struggled to get a full roster for tournaments, although the players who do show up get plenty of playing time. Their 14-person regional roster is just barely enough to play two full lines before snitch on pitch, but Hoosier Daddies have done well with what they have so far. At all of their tournaments this season, the team has been missing major pieces to make them more competitive. At Tournament of the Stars they were noticeably missing Devon McCoy, Cecelia Westbrook and Anthony Votaw. At Ball Brothers they were without Blake Fitzgerald. We still have not seen old Ball State players like Danielle Anderson or Zach Rupp play officially. Former Indiana University players Gabe Johnson and Tyler Martin are expected to be on the team as well but also have yet to show up on any roster. A full Hoosier Daddies would undoubtedly bring chaos to the community theatre. They are still unlikely to win the region but could feasibly steal games from either Lake Erie or Ohio Glory over their six head-to-heads. Don’t write off this team just yet. The marquee matchup for the weekend is the series between The Eighth Man’s No. 5 Lake Erie and No. 8 Ohio Glory. If you are a fan of quidditch you should be hoping that third game matters. Each team is filled with regional all stars and on paper they matchup well for what should be a great series. Lake Erie notably became the first Great Lakes community team to last more than one season, and, so far, they have been tearing up the region. Their lone loss is to the University of Missouri at Ball Brothers and even then they came back to beat Mizzou later in the day to win the tournament. Ohio Glory comes in as the underdogs after losing to Lake Erie in their only matchup. But Ohio Glory boasts the most players to see a regional final of the two squads. Of the 16 players rostered this weekend, 14 have been on a Bowling Green team that has made it to five consecutive regional championship finals and secured two titles. They also have a lot of pieces from the back-to-back Elite Eight runs Bowling Green has made at the last two national championships. The big matchup to watch will be the seekers. Both have multiple seekers they are comfortable putting out in big games, but each have a clear go-to and each should see a bulk of the time after 18 minutes. Bowling of Lake Erie and Roitblat of Ohio Glory have squared off numerous times during their time for Ball State and Bowling Green, respectively. These athletes was put on display during a stretch of 10 games where their college programs traded wins back and forth over three seasons. Each have been deservedly nominated to the US National Team and each will likely see playing time before 18 minutes. With a smaller roster Roitblat may be tasked to play more minutes before heading to seek, which could be the difference in these games. Either way expect no more than one out-of-range game.